The very famous Junky Jungle gets a new make-over for a better result. This full size Khukuri blade made for rougher use is made more tougher, meaner and stronger with the implement of Aluminum handle and BLACK BLADE. The very famous Junky Jungle gets a new make-over for a better result. 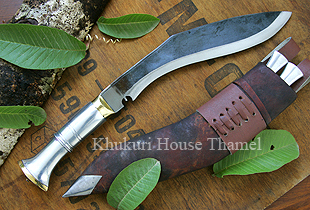 This standard full size Khukuri blade made for rougher use is made more tougher, meaner and stronger with the implement of Aluminum handle which is the strongest handle as it never breaks, cracks or fear of insects eating as in the case of wood. It does have it drawback and is the only one is becoming slippery when sweaty hands. Leather glove is recommended to use this shinny beauty. The blade too has a BLACK unpolished finish making it better for daily use as this finish will not spoil the look of this blade when in use. The same Raw buffalo leather is used on the scabbard which is untanned and natural looking. The two small knives have Aluminum handles also.